“Kickstand is now up,” one of the 20 or so engineers and designers calls out in the design studio. “OK,” a few respond in near unison. Half of them are holding their phones in the air, pointed at the half-finished motorcycle that’s standing on a lift table like an equestrian statue on a pedestal. Another engineer flips the red switch on the handlebars, then moves his hand onto the throttle and twists. Just a touch at first, then properly. With a whine, the rear wheel, suspended in the air, transforms into a blur of black rubber. The room whoops and claps. It’s September 2017, and the men and women of Zero Motorcycles have spent a year and a half getting to this point, to finally see their all-new, fully electric bike work its motor and battery. After another year and a half of work, the SR/F, Zero’s first significantly new offering in years, is making its debut—and just in time. Zero has led the nascent electric motorcycle market over the past decade, but now bigger players are moving into its territory. Harley-Davidson is taking preorders for its battery-powered LiveWire. Ducati’s CEO says “the future is electric.” Kawasaki has patents that indicate a similar worldview. Rather than trying to disguise the SR/F as a conventional motorcycle, Zero’s design team left the 14.4-kWh battery exposed, emphasizing the bike’s electric nature. Based on the specs, that gap looks like a chasm. Harley’s LiveWire will produce 74 horsepower and 54 pound-feet of torque, hits 95 mph, and offers a max range of 109 miles. Zero’s SR/F wallops that, with 110 horsepower, 140 pound-feet of torque, a 120 mph top speed, and 161 miles of range. And this bike starts at $18,995—about $10,000 cheaper than the Harley. Having relevant experience, it appears, makes a difference. Zero, whose 200 employees are all based in woodsy Scotts Valley, just inland of Santa Cruz, California, started official work on the SR/F three years ago. According to engineer Matt Bentley, though, the team has been thinking about it for closer to five, stockpiling ideas for improvements they couldn’t fit into the company’s existing line of bikes. This entirely new model gave Zero the chance to put everything they’d thought of to use, or at least to try it out. From the start, staffers in the design studio, with a floor specked with bits of modeling clay, wanted to emphasize the electric setup that makes the streetfighter-style SR/F whir. Sure, they could have dressed up the battery to resemble an engine for a more conventional look. But Bentley says, in a not entirely joking dramatic tone, “We would not commit this crime.” Starting with scale models before moving onto clay, they left the battery exposed and central; it makes up the bulk of the bike’s visible mass. It’s the same size, 14.4 kilowatt-hours, as those on Zero’s other bikes, but with a new and more efficient design. The SR/F is the product of three years of work, and more than a few design tweaks. The team worked in scale models and clay before settling on the final form. The air-cooled, copper-colored motor, which is bigger and generates more torque than its predecessor, sits behind the battery. 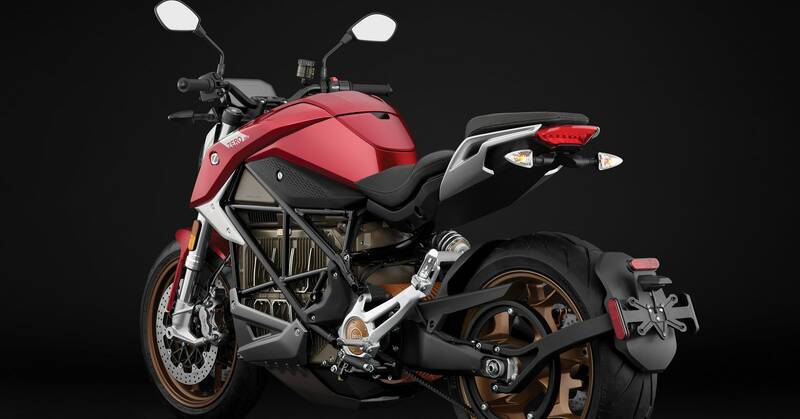 It and everything else on the bike are controlled by the latest iteration of Zero’s software, which it calls Cypher III. Like most electric bikes and modern cars, it offers different ride modes that adjust the rate of acceleration and traction control. Here, you get Sport (pretty much full power), Street (75 percent of that), Rain (which cuts the torque in half), and Custom (whatever you like). And because it’s 2019, that software will allow for over-the-air updates, as Zero continues to improve the code that turns throttle twists and brake grabs into movement. Because electric vehicles don’t need transmissions, Zero riders don’t have to worry about grabbing a clutch or flicking their left foot up and down to change gears. That makes for an easier experience, says Brian Wismann, Zero’s head of product. While old-school riders may pooh-pooh the lack of skill, Wismann says more riders can get more out of this bike. “They just have to know how to do this,” he says, miming the twist of a throttle. And like many new cars, the SR/F comes with a dedicated app, so owners can track and share their rides, and get alerts if their bike falls over or starts moving while they’re at lunch. With the design set, Zero’s test team took prototypes to Death Valley for some hot weather testing—this rider’s backpack is jammed with sensors tracking the bike’s performance. The 485-pound SR/F gets an LED headlight and brake lights, along with a center screen. Since riders wear gloves anyway, the team skipped a touch screen and focused on making the thing visible in direct sunlight and hardy enough to withstand the elements. Thinking ahead to production, the team designed a wiring harness that’s easier to install. In the factory—adjoining Zero’s design and office space—the production team is tracking how long it takes them to build each part of the bike, and working to drive those times down. They subject every battery they produce to a brutal hosing, making sure no bikes suffer when the rain starts falling. And this is after torturing the bike in places like Death Valley, where the air got so hot the team had to put their GoPros on ice to keep them running. The goal of all this is to put Zero back ahead of the electric motorcycle market, but Paschel doesn’t expect to stop anytime soon. The core of the SR/F will likely be the basis of new models to come, and the team’s already storing away fresh ideas for the next ground-up redesign. Of course, not everything on the SR/F is new; the bike shares some key components with Zero’s existing products. Those would be the pegs, turn signals, and mirrors. Some classics are better left alone. Everything else, though, is up for grabs. Story updated on Monday, February 25 at 12:15 ET to correct the spelling of Brian Wismann’s name.